Kevin Anderson, 25 year Dedicated Volunteer Today, with a mission of empowering people who are blind or visually impaired to be safe and travel independently every day, the Leader Dogs for the Blind is a valuable organization. Their actions are guided by the important values of doing what is right, respect and compassion, passion for the work, superior experience, teamwork, innovation and safety. 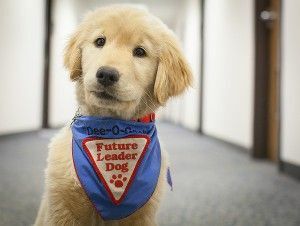 Look forward to a visit with Fillip, one of the Leader Dogs in training! Fillip will do the presentation and Kevin, Puppy Raiser and former Puppy Counselor will be our interpreter!